A 4.2 mile walk visiting the Mill Bridges, Breamore Station and continuing along the line of the railway to Burgate Cross. From Burgate Manor Farm, the route crosses the watermeadows to Folds Farm and then back to Woodgreen over Castle Hill. 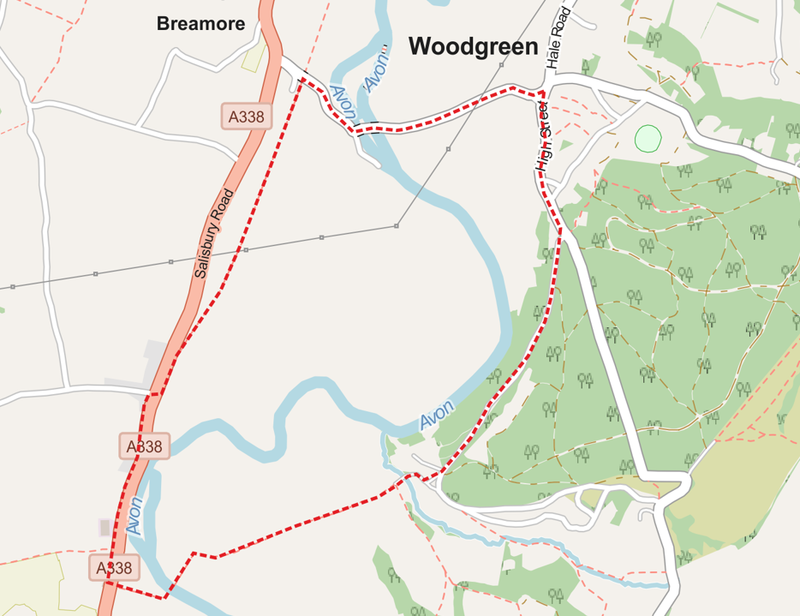 The route follows a 2-mile section of the disused railway line from Breamore which was opened as a public footpath in 2012. Another path through Lower Burgate Farm crosses the Avon via a steel suspension bridge erected in 1949-50 (and made from reused parts of a Bailey bridge) allowing a return via Folds Farm and Castle Hill. Start at the telephone box. Take the Breamore Road over the Mill Bridges. Breamore Arch railway bridge Take the gravel track down the left side of the bridge. Access the railway line down a narrow path on the right side of a barn. Railway path Turn left along the path, passing the old station and platforms. Burgate Cross After about a mile, at the end of the path, cross the A338 to the pavement on the far side. Continue to Burgate. Burgate Manor Farm When you reach the Surma Valley restaurant, cross the A338 and take the road into Burgate Manor Farm. Bridge Pass through the farm and, opposite the final barn on the right, take the path on the left to the suspension bridge over the Avon. Watermeadows Go through the gate on the far side of the bridge and follow the path across the watermeadows to Folds Farm. Folds Farm Continue through the farm gate, over a cattlegrid, out onto a gravel track. Castle Hill road Turn left, initially on a gravel track and then onto a tarmac road up to Castle Hill. High Street Turn left at the junction and return to the starting point.